Residents of the town of Moab in Utah are hoping that in the very near future, visitors are going to get much better access to a number of the preserved dinosaur footprints and tracks that have been found in the area. This part of Grand County (Eastern Utah), is famous for its extensive trace fossils of dinosaurs and other Mesozoic creatures, earlier this year, Everything Dinosaur reported on the theft of a three-toed dinosaur footprint. Such thefts are an all too common occurrence these days and news that the Bureau of Land Management (BLM) is planning a properly organised dinosaur footprint trail is most welcome. Last month, Utah resident Jared Ehlers, who had originally denied any involvement in the theft, admitted stealing and disposing of a dinosaur footprint fossil. By pleading guilty at a pre-trial hearing, Mr Ehlers was able to have the charges of theft, destruction of evidence and depredation of government property dropped. Under the terms of a plea deal, he was fined $15,000 USD (£9,000 GBP) and ordered to serve a year’s probation, including six months of home confinement. The tracks that the BLM intend to create a trail for were discovered by a hiker in 2009. Scientists from the University of Colorado in conjunction with the BLM had began excavations last year, over the last few weeks a team of volunteers have been clearing away the last of the surface material in preparation for the first public tours. Up until now the actual location was kept under wraps, this has helped the palaeontologists and ichnologists (specialists who study trace fossils), to map the fossil site and to prevent any potential thefts. A Three-toed dinosaur footprint (Moab). Over two hundred individual tracks have been uncovered to date and in at least one area an extensive trackway left by a single dinosaur has been discovered. This trackway consists of seventeen consecutive prints. Scientists estimate that at least ten different genera may be represented by the trace fossil material. For Bureau of Land Management palaeontologist, Rebecca Hunt-Foster, the opportunity to help create a tourist trail leading to a greater understanding of the importance of this area for fossils, may help deter thefts in the future. It is all part of helping to educate and inform local residents and visitors to the area. Such is the excellent state of preservation that even the tail drag from a prehistoric crocodile has been identified. Preserved in the stone a tail drag mark left by a Cretaceous crocodile. It is hoped that once the site has been cleared, BLM staff will finish formally mapping and plotting the extensive trackway using three-dimensional photography (photogrammetry). The fossils were found in strata that make up part of the Ruby Ranch Member of the Cedar Mountain Formation. The fossils are believed to be around 125 million years of age (Late Barremian faunal stage to Early Aptian faunal stage of the Cretaceous). As such, these trace fossils are slightly younger than the majority of the dinosaur footprints and other trace fossils preserved in the exposed Wessex Formation of the Isle of Wight. As the BLM’s regional palaeontologist, Rebecca admits that providing greater access to these sites whilst maintaining their security is a delicate balancing act. 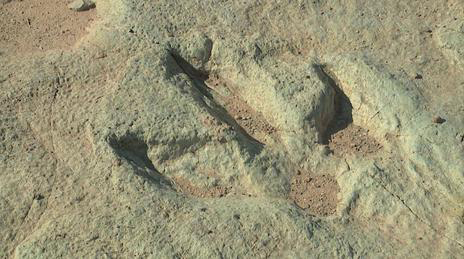 For example, a number of the prints were made by a three-toed Theropod, these tracks are very similar to the one stolen and subsequently lost earlier this year. Once the volunteers have finished clearing the site and the mapping is completed, then the scientific value of these trace fossils will have some measure of protection. For having mapped and plotted the tracks very accurately the prints can be replicated, should the fossils be eroded away, damaged or even stolen the data recorded will still permit palaeontologists to study them. The Bureau of Land Management is currently fund raising to build a trail to the dinosaur tracks. The agency hopes to have the site open to the public in about six weeks time.